Got a new tool over the weekend! Been wanting one of these for a while. Reviews are mixed, but apparently one of the things to look out for was the model number. At some point, HF started phasing out the #60603 model in favor of the #32879. Both are rated for 20 tons and have nearly identical overall dimensions, but the 60603 was rumored to have thicker steel and bolt-together construction. 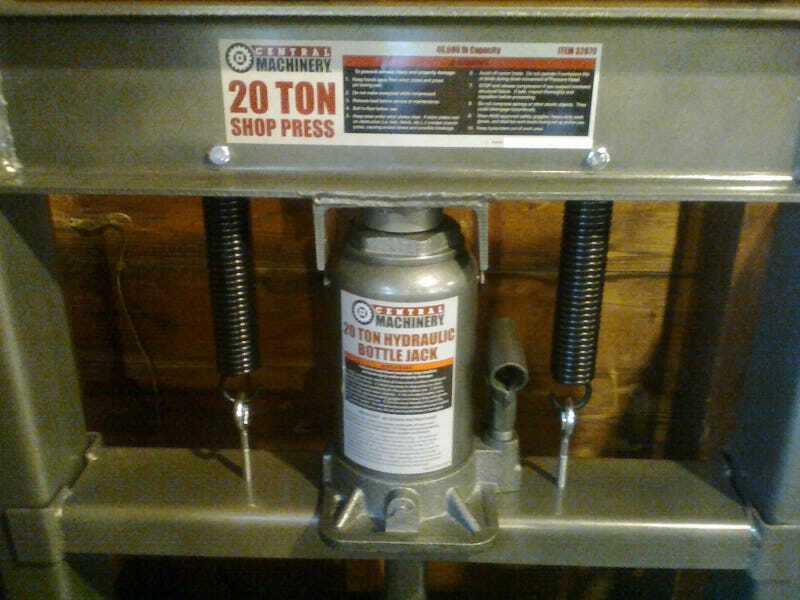 I’m a bit of a noob when it comes to shop presses, and hadn’t quite made up my mind whether bolts or welds were better. I guess a weld has the potential to be stronger, if done properly. But if something should happen, I’d rather find myself having to replace a sheared bolt than deal with cracked welds. Central Machinery #60603. Not the thick plate between the piston head and top frame channel, totally absent on the 32879. I didn’t get a good look at the bolts, but looking back at the pics I took, they appear to be... grade 2? Easily upgraded if necessary. Welded construction, minimal bolting required for assembly. No thick plate between piston head and upper frame, just one small piece of channel and a slice of tubing to keep the jack centered. Side view of press apron, view partially obstructed by neighboring shelving unit. Close-up of feet. A piece of angle is welded to both sides of the frame to stabilize the bottom. I intend to drill the feet later and bolt the whole thing down, but not until I’m satisfied that this press is a keeper. For what it’s worth, the welds don’t look too boogery. The only bolts that I had to assemble were for the feet, and to attach the retract springs. All bolt-holes lined up just fine. I like the color too. This thing easily passes the initial quality test. I checked the hydraulic fluid level, and it seems slightly low. There’s enough to fully extend the ram, though. The instructions don’t get any more specific than to use “hydraulic fluid”. Should I bother trying to find the correct fluid to top it off? All I have on-hand is PS fluid, Mercon V transmission oil, and DOT3/4 brake fluid. I did manage to scrape up a few extra inches of floor space by using an extra cinder block and some wood to support the front of the press. By lifting up the front, I could tuck the back of the feet into the stud bays of the garage. Seriously though, I need to find a way to test this thing for real. It doesn’t have a built-in gauge like some of the nicer ones do, but there’s got to be a way to measure force, or simulate a 20-ton load to see how the jack and frame hold up. Preferably something non-intrusive so that I can still return it if I have to. Makes me wonder- why the design change from the 60603? Cost, no doubt. But does that mean the 60603 was overbuilt? Shame I missed out on it. Oh well, if this one can handle 20 tons without ripping itself apart, I’ll be satisfied. Tucked away into its own little corner. As infrequently as I’ll probably be using this thing, it was important to me to find a place that was out-of-the-way.